Today was one of those quiet home days - the husband was out fishing, the three of us couldn't really be bothered going out anywhere and so we just pottered, did some chores and hung out at home. Eventually the 5 year old got bored, the 2 year old got grumpy and I knew my time was up. Out came the Fimo. Have you ever used it before? I think I have but it was so long ago I really can't remember. It's fantastic stuff - a bit like play dough, although harder and it takes a bit more work to soften it up, and it comes in beautiful, bright colours. I'm sure there is so much you can do with it but today we just kept it very simple and made beads, a snake and a man. Once you've finished creating it gets baked in the oven for 30 minutes at 110C and then you've got yourself some resin-like beads to play with. What's not to love? What have your experiences been with Fimo? I'd love to hear about them, or even better post a pic to my Facebook page. 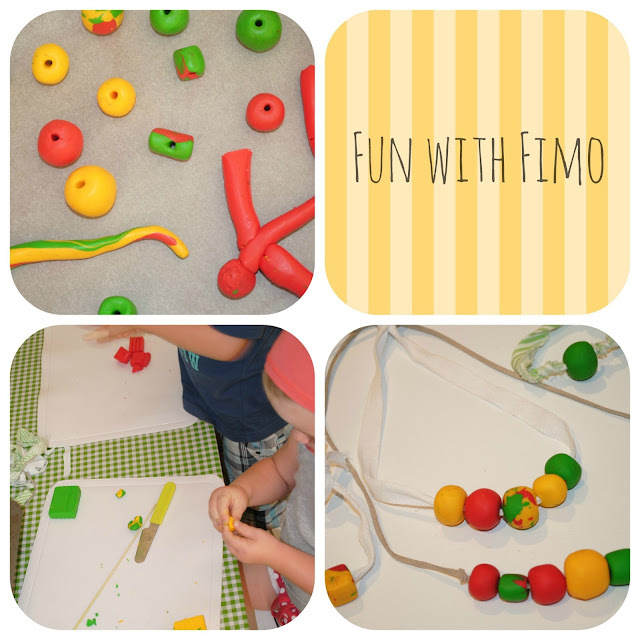 We could probably tackle something a little more creative and challenging than beads next time so feel free to share the Fimo goodness! We had to make a model for a school project so as she is crazy about Katty Perry we had to use modelling clay to construct the model. I have to say that I really enjoyed working the clay into shape and trying to get some human shape into it. It's funny to find out from the teacher during the week that all she was asked to do was a drawing. Oh well - give her point for going above and beyond. Cute diy beads :) It looks like everyone had fun! Thanks for sharing at the weekly creative.